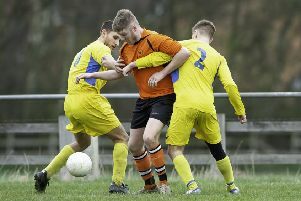 Littletown secured a third straight victory in the West Riding County Amateur League Premier Division last Saturday as they overcame Route One Rovers 4-1 to keep on the coat tails of leaders Golcar United. Golcar thrashed third placed TVR United and remain 11 points clear of fourth placed Littletown, who have three games in hand. Shoab Iqbal scored for Route One but goals from Pat Sykes, Joe Jagger, Dave Wright and Sam Jordan were enough to secure Littletown’s eighth win from 11 league games. Littletown’s only defeat so far came at the hands of local rivals Lower Hopton on October 27 and the Mirfield side maintained second place in the table thanks to a 3-2 win away to Ovenden West Riding. Lower Hopton are nine points behind Golcar and have played the same number of games. A Gareth Gaukroger brace helped Ovenden into a 2-1 half-time lead last Saturday but Hopton turned the game round after the break and goals from Josh Cooper, Lee Turner and James Heeley earned their ninth win of the season. n Wyke Wanderers remain second-bottom in the West Yorkshire League Premier Division after a 5-1 defeat at title chasing Beeston St Anthonys. Karl Fawcett hit Wyke’s consolation goal but second placed Beeston eased to victory with a brace each from Gareth Groves and Matthew Moor plus a Stephen Crawford strike. Hartshead slipped to a 3-1 defeat at home to Kirk Deighton Rangers in Division One, despite a Benjamin Smith goal, while Howden Clough stay bottom after second half goals by Jamie Etheridge and Joshua Wilson (two) earned Wetherby Athletic a 3-0 win. Hunsworth had Oliver Durkin and Keiran Senior (two) on target but couldn’t prevent a 7-3 defeat to Altofts and they are 12th in Division Two. Goals either side of half-time by David Keighley and John Penn were enough to earn Field Reserves a 2-0 win over Hartshead Reserves in Alliance Division One. Howden Clough Reserves went down 4-1 at Salts Reserves in Alliance Division Two despite a Jack Butcher goal, while Wyke Wanderers Reserves had Connor Gray on target in a 6-2 defeat by Rothwell Reserves.